You may already have all parts you need to make this cable. The USB-C iPad Pro can charge your iPhone, but you have to buy one of Apple’s expensive USB-C to Lightning cables. Or do you? With a USB-C-to-microUSB cable, and the right little adapter, you can make your own, today. 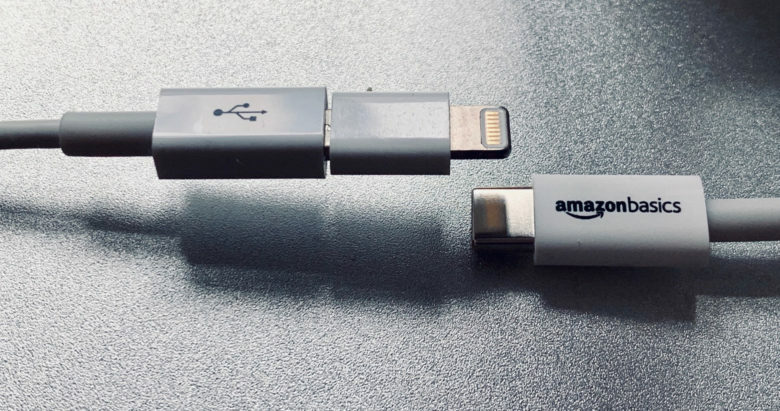 Then, just add the Apple adapter to a cheap microUSB-to-USB-C cable, like this one from Amazon, and you have a fully functional Lightning-to-USB-C cable. I tried it this morning. Not only does the iPad charge the iPhone, but it also lets the iPad import photos from the iPhone, just as if you were using the Camera Connection Kit and regular Lightning cable. You also could use a third-party knockoff of the Apple adapter. But then you would run similar risks to using a knockoff Lightning-to-USB-C cable. If you have these parts already laying around, try it out now.